I started with the thought of traveling when I came to South America. Since I didn’t speak any Spanish (but I really wanted to learn some during this trip) I thought it might be wise to start in an environment that “I know” to pick up the first few words in Spanish. Therefore I was looking for a place to volunteer, so I would have the environment that I was looking for. When I was looking for places to volunteer, I was thinking of staying for 3 weeks, maybe a month. The work CMA is doing inspired me though, from the first moment and I decided to stay for 2 whole months and to travel during the weekends only. I still got to see a lot of Bolivia like the Salt Flats, Death Road or the mines in Potosi. These are all trips worth doing. I can also recommend staying at one place for a longer time to get to know the local people, their traditions and to understand their behavior. The people working at CMA, Ivonne, Carminia, Florencio and the other volunteers made it really easy for me to adapt to the new environment. They also helped me out when I didn’t understand their Spanish and kept being patient. Therefore working at CMA was made really comfortable. What I enjoyed most during working here was putting a smile on people’s face though. 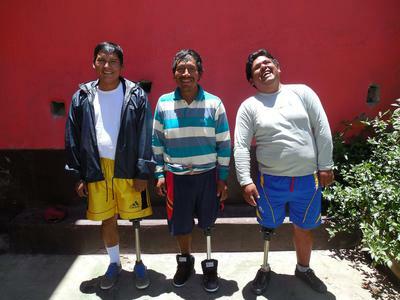 Seeing the patients doing their first steps with their new artificial leg was a great feeling. Seeing somebody walking for the first time in several years was amazing already, but knowing I helped this person doing that was even better. Therefore volunteering at CMA is an experience I would recommend anybody to do if they have the chance. It was heartwarming to read your story. Thanks for taking the time to share this.